Make a difference in the lives of vulnerable children in California. Use your voice to change the child welfare system in California! Convened by the Office of Child Abuse Prevention (OCAP), they are seeking citizen (YOUR) input at their quarterly meetings. Now is your chance to make recommendations to the State! 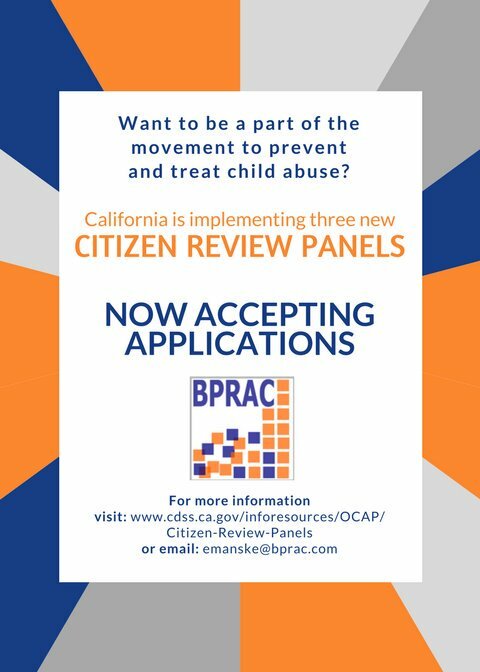 Apply now to become a member of the California Child-welfare Citizen Review Panels (CRPs). Meetings are held 4 times a year. Participation can be by phone, computer, or in-person. Stipends and travel costs may be covered. The attached report provides additional information.